With your well-being in mind, Cassida has developed a dust collector that helps reduce health risks associated with counting money. This collector is designed to capture air-blown dust and micro particles, which are so abundant on bills. Smartly placed underneath the unit, the collector does not require any special care and does not interfere with any operations of the user. 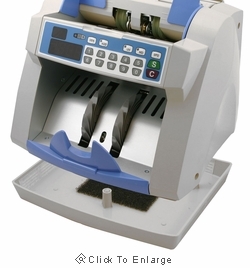 This dust collector is only suitable for Cassida 85 series currency counters. PLEASE NOTE: The dust collector is shown in the bottom of the picture. Machine shown in picture is NOT included. View all of our money counters in our store.